This blog is for the Developers who wants to get a Salesforce Developer I Certification . What is Salesforce Certification? Why is it so important for the developers seeking a career in Salesforce? Salesforce certification is vital to the salesforce career path as it differentiates you from other developers, makes you an expert in your field. This Certificate is provided by salesforce.com where people demonstrate and prove their technical Skills in different areas of Salesforce. It’s a damn good certification, if you are thinking about a career in Salesforce, by enhancing your skills and expertise in respective fields. It is very easy to get hired in an organization with a salesforce certification in hand. 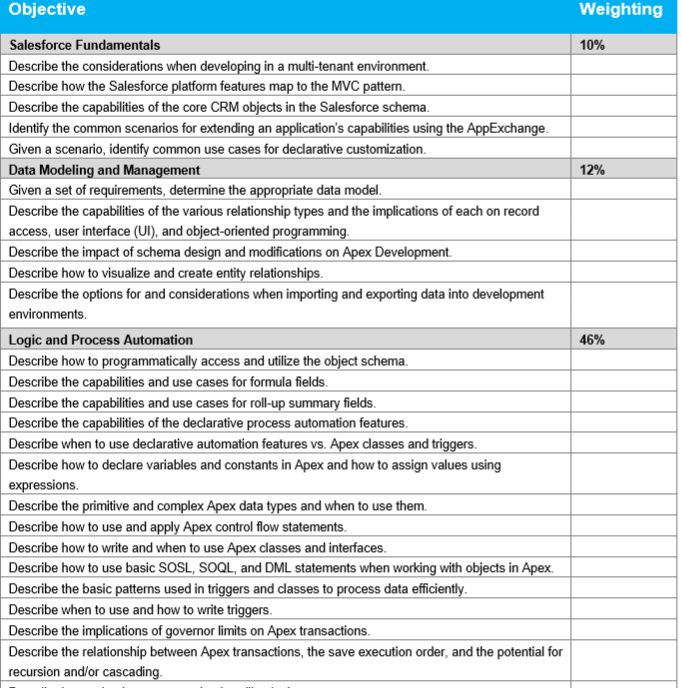 Course Content and their weightage -: The Salesforce Certified Platform Developer I exam measures a candidate’s knowledge and skills related to the objectives listed below. 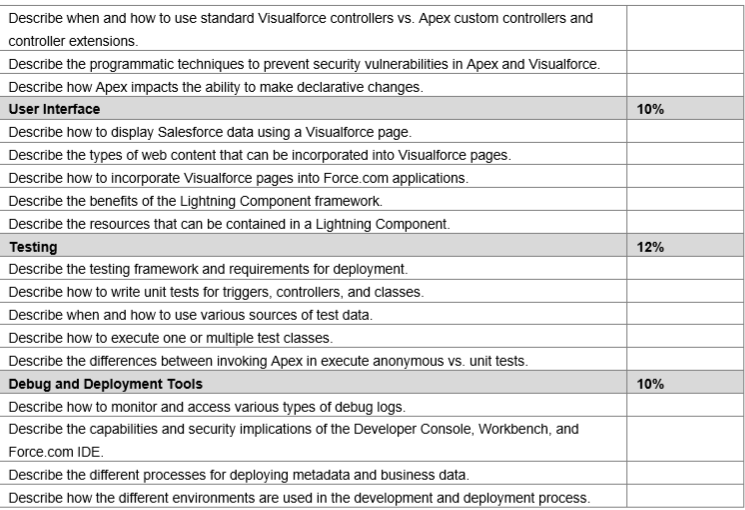 A candidate should have hands-on experience of developing custom applications on the Force.com platform and have demonstrated the application of each of the features/functions below. 3. 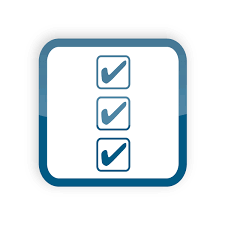 Go through /Solve previous years certification:- Preparing from previous year question papers is always a good strategy to cover frequently asked topics in a short span of time. 5. And last but not least, be confident and relaxed while writing the exam and remember the best way to gain confidence is to do more and more practice. So all the best guys for exam. The exam is simple and easy. All you need is to do practice.